Architecture buff or not, you’re most likely familiar with the fabled Frank Lloyd Wright, one of America’s most iconic architects. The majority of the 400 or so Wright-designed structures that still exist (yes, bafflingly, some have been demolished over the years) are in the Midwest and on the East Coast, with just a few dozen in California and only a handful of those in Los Angeles. 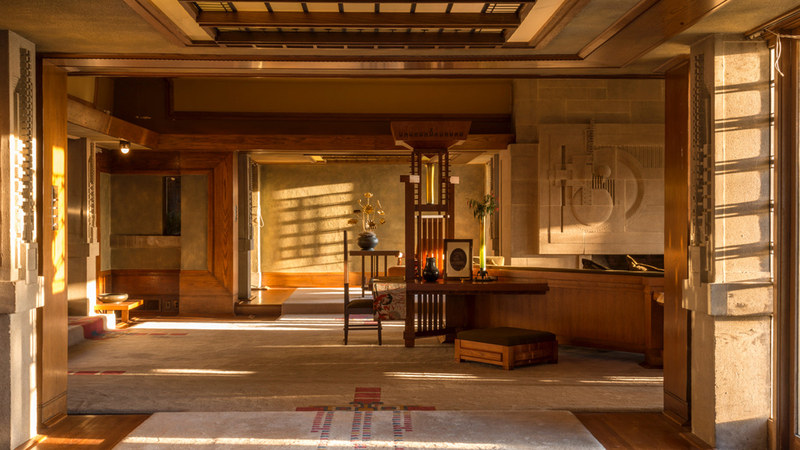 But one of his most impressive creations – known as the Hollyhock House – sits just four miles from The Hollywood Roosevelt, is open to the public, and should go straight to the top of your must-do list whether you’re in town for just for a few days or are a longstanding local. Here’s what you need to know about the mind-blowing masterpiece. Wright made his first foray into LA architecture after oil heiress Aline Barnsdall bought a 36-acre site in Hollywood known as Olive Hill in 1919 and commissioned him to design a performing arts complex that was supposed to include theaters, an art studio multiple residences, and more. At the time, Wright was in the middle of building the Imperial Hotel in Tokyo and soon proved he wasn’t much of a multi-tasker by neglecting Barnsdall’s project. 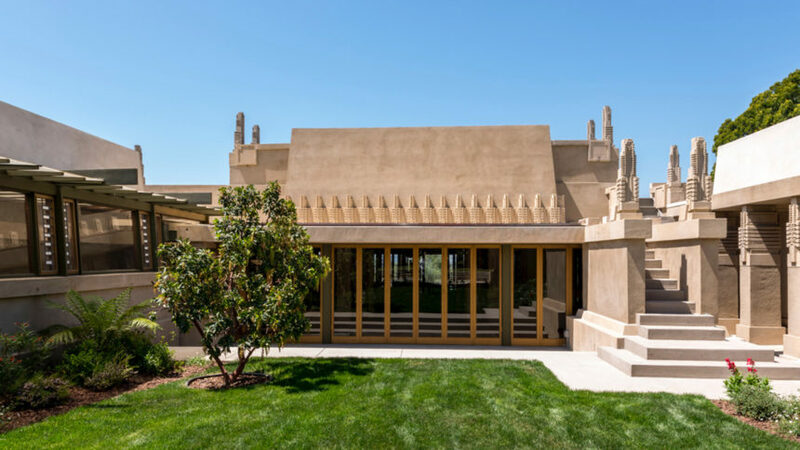 After firing him two years in, only part of the project – including the 5,000-square-foot main residence dubbed Hollyhock House — ended up coming to fruition. Barnsdall later donated it along with 11 surrounding acres (now Barnsdall Art Park) to the city and, after a variety of incarnations over the years, Hollyhock became a National Historic Landmark in 2007 and its long-awaited restoration was completed in 2015. Wright turned to pre-Columbian Mexico for inspiration for the project, giving the exterior of the home the look of an ancient temple. He clearly designed the massive residence with LA’s enviable weather in mind: The entire home surrounds a courtyard and each indoor space is mirrored by a connected outdoor counterpart. While the place touts a slew of other unique features – from its 250-pound cast concrete doors to camouflaged locks to art glass windows throughout – it also gives lots of nods to Barnsdall’s favorite flower … the Hollyhock. Architecture aficionados often point to the massive fireplace as the home’s most drool-worthy feature — with its abstract Hollyhock motif etched into the cast concrete — but the hearth was also meant for a grander purpose. It represents the element of fire, while the concrete is Earth, the skylight above represents air, and a pool below (that’s now empty) serves as water. There are a few different options depending on whether you want to DIY your visit or go with a guide. All are $7 a pop, making the Hollyhock House one of the city’s more reasonably priced sights to see. The “Walk Wright In” self-guided tours take place from 11am to 4pm Thursday through Sunday, while docent-led tours of the exterior are available those same days at 11:15 am, 12:00 pm, 12:45 pm, and last about 20 minutes. 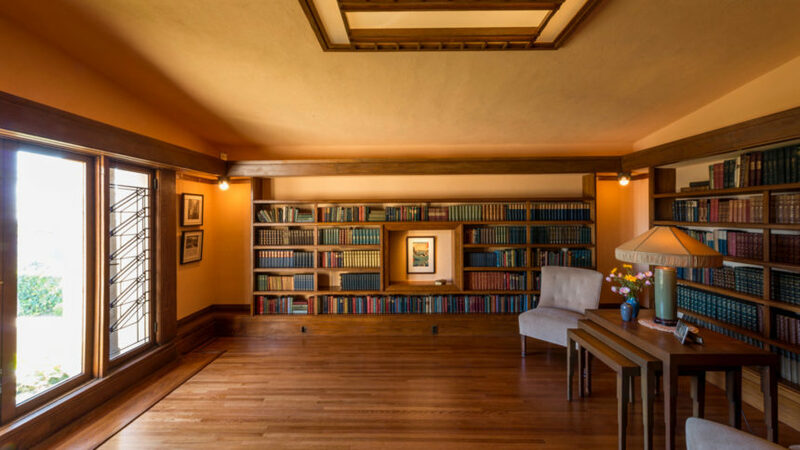 If you’re interested in learning even more about the home, go for one of the 45-minute docent-led tours scheduled on Tuesdays and Wednesdays at 11am and 12pm. You can purchase any of the above in advance online. While you’re up there, explore the park and check out the LA Municipal Art Gallery and the Barnsdall Art Center, where you can sign up for classes ranging from photography to loom weaving. Why doesn’t all of LA know about the bounty of art and culture at Barnsdall? We’re not sure, but keep it quiet for now.